Associate Professor Jayson Semmens works in the Fisheries and Aquaculture Centre at the Institute for Marine and Antarctic Studies, University of Tasmania, where the focus is on sustainable fisheries biology/ecology. In particular, his work focuses on applying biotelemetry, biologging, accelerometry and ecophysiology to understanding marine populations and ensuring their sustainability. He is particularly interested in using these techniques to examine factors that influence the expression of life history parameters across a wide range of animal groups, particularly sharks and rays, fish, and cephalopods. He also has extensive expertise/interest in scallop fisheries biology/ecology. Assoc. Prof. Semmens arrived at IMAS in November 1999 after completing a PhD at James Cook University in Cephalopod Biology. He was awarded an ARC Postdoc in 2001 on Octopus biology/ecology, which he completed in 2004. Since then, he has developed research programs in spatial ecology and ecophysiology, predominately focused on fish, sharks and rays; scallop fisheries biology/ecology; and effects of seismic surveying on invertebrates. Jayson has authored more than 70 peer-reviewed publications, including one in PNAS and one in Nature Climate Change. He has sourced >$7.5 M in research funding, including Category 1 Grants (FRDC Grants; ARC Discovery, Linkage & Infrastructure Grants). He has also been awarded two Japanese Society for Promotion of Science Fellowships for his work using accelerometry to examine feeding ecology in sharks. He conducts innovative and inter-disciplinary field and laboratory-based research to address questions critical to gaining an understanding of marine populations and ensuring their sustainability. He is particularly interested in factors that influence expression of life history parameters, such as growth, fecundity, mortality rates and reproductive scheduling. Some of the main research tools he employs are biotelemetry, biologging, accelerometry, respirometry and histology. He works across a wide range of animal groups, particularly sharks and rays, fish, cephalopods and scallops. Jayson has successfully supervised: 11 PhD students (3 at other Universities); 8 honours students; 1 Master of Antarctic Science student. Jayson's research aligns to the University's research theme of Marine, Antarctic and Maritime. He conducts research that advances our understanding of marine ecosystems, while promoting sustainable management of marine resources. Jayson is particularly interested in assessing the role of animal energetics; activity/behaviour; and environmental change as key processes structuring marine populations; influencing life history parameters; and ultimately influencing survival. Jayson has initiated, or extended, collaborations with the Commonwealth Scientific and Industrial Research Organisation, Marine and Atmospheric Research; 9 other Australian universities; and > 30 international research institutes in countries including UK, Canada, Japan, Ecuador and South Africa. Determining when and where to fish: Linking scallop spawning, settlement, size and condition to collaborative spatial harvest and industry in-season management strategies. This research will investigate the ecological consequences of climate-driven marine species range shifts. Globally, species are shifting poleward with rising temperatures, which has critical impacts on ecosystems and humans that depend on them. A key focus of climate change biology is understanding and predicting the consequences of ongoing and future range shifts. However, attempts to date to understand and predict effects of range shifts have been hindered by the scalability of laboratory studies and a lack of mechanistic insight from field observational studies. Using the contemporary range extension of snapper Chrysophrys auratus in the south-east Australian ocean warming hotspot as a case study we are investigating: (1)Which mechanisms underpin range extensions (e.g. thermal tolerance, reproduction and migration)? (2)What are the resulting consequences (e.g. altered growth rates, ecosystem impacts)? This research will investigate the ecological consequences of climate-driven marine species range shifts. Globally, species are shifting poleward with rising temperatures, which has critical impacts on ecosystems and humans that depend on them. A key focus of climate change biology is understanding and predicting the consequences of ongoing and future range shifts. However, attempts to date to understand and predict effects of range shifts have been hindered by the scalability of laboratory studies and a lack of mechanistic insight from field observational studies. Using the contemporary range extension of snapper Chrysophrys auratus in the south-east Australian ocean warming hotspot as a case study we are investigating:(1) Which mechanisms underpin range extensions (e.g. thermal tolerance, reproduction and migration)? (2) What are the resulting consequences (e.g. altered growth rates, ecosystem impacts)? To bring together available biological, catch and effort information to determine the status of Tasmanias key wild catch fish stocks against a nationally agreed reporting framework and provide a resource to inform the general public, policy makers and industry on the sustainability of these stocks. Biological responses to climate change at the Individual organism level are likely to alter the structure and function of marine ecosystems.My project will enhance our ability to understand and predict how climate change will alter the physiology and morphology of cephalopods, which in turn feeds into a large-scale approach used to assess ecosystem level effects. By using physiology experiments and diet studies of southern calamari to develop mechanistic models, and then combing these with species distribution models, this project could enhance the ability of fisheries and conservation management to mitigate and prevent the damaging ecological impacts of climate change. Long-nosed fur seal (LNFS, formerly New Zealand fur seal, Arctocephalus forsteri) breeding range in South Australia is distributed across a relatively small geographic area characterized by a southern distribution, associated with narrow shelves in proximity to localized seasonal coastal upwelling in summer and autumn. Early in lactation (December to March), females undertake short foraging trips (~4 days duration) to near shelf waters (70-90 km the colony), in regions associated with localised upwelling. However, between April to May females switch to foraging in distant oceanic waters 700-1,000 km to the south of breeding colonies, associated with the Subtropical Front (STF), where they continue to forage until the weaning of their pup in September/October. These winter foraging trips can last more than two weeks. It is unclear if this major shift in foraging distribution occurs in response to: 1) reduced prey availability as a consequence of cessation in coastal upwelling; 2) life-history/pup growth factors that enable females to switch to more reliable but distant foraging grounds once their pup reaches a size and condition threshold where they can sustain longer fasts; or 3) a combination of these factors.Understanding the role of the in-situ oceanographic and life history factors in shaping alternate summer and winter foraging strategies is the central focus of this study. Changes in shelf oceanographic features associated with fur seal foraging areas will be monitored using a novel approach, by simultaneously fitting biologging tags to fur seals and oceanographic (CTD/Fluorometer/Irradiance) tags onto Australian sea lion males. Sea lions forage over shelf waters year round and sample the entire water column, providing a means to monitor changes in local oceanographic conditions from the summer to winter period. Sustainable finfish aquaculture is dependent on a benthic environment that can assimilate and process farm particulate wastes. This project will help inform the likely effectiveness and duration of any given fallowing or remediation strategy, and as such is essential for both operational management of farming activities and the long-term management of the harbour. This will involve a combination of benthic surveys, a real time observation network and oxygen transport modelling. The central outcome of this research will be better advice on appropriate fallowing and remediation strategies for the conditions currently occurring in Macquarie Harbour. Robust scientific understanding of benthic and water column condition in the Harbour, with a particular focus on dissolved oxygen dynamics in the water column, will provide a much better appreciation of the response of benthic communities to fallowing and remediation strategies. This project is a desktop study to look at the risk of attracting sharks by establishing aquaculture infrastructure in Storm Bay, Tasmania. Addressing & demonstrating the environmental sustainability of fishing particularly trawling remains amajor challenge & priority in management plans for many demersal fisheries in Australia. The effects of trawling (EoT) are contentious, with often negative perceptions among the public & media, thus impeding social licence to operate. Australian fisheries must meet legislative requirements under the EPBC Act & regular environmental assessment by the Department of Environment. Environmental Risk Assessment(ERA) approaches have been used for assessing EoT in response to EPBC Assessment requirements, primarily for bycatch at a qualitative or semi-quantitative level. However, EPBC Principle 2 / Objective 3 (minimize impacts on the ecosystem, including habitats & communities) has rarely been addressed & almost never quantitatively. These shortcomings limit the goal of ensuring no unacceptable impacts on ecosystems. Further, the annual Fishery Status Reports aim to include broader environmental reporting & the Healthcheck project (FRDC 2014/008) has identified suitable indicators, such as habitat footprint (e.g. % exposed tofishing). This Sense-T project brings together the Tasmanian Salmonid Growers' Association, IMAS and CSIRO to collect and analyse data from salmon farms in Macquarie Harbour. Sensors will be attached to individual 'sentinel' fish in pens in addition to sensors in the environment. Data will be collected on fish behaviour as well as environmental conditions such as water temperature, dissolved oxygen and depth. This will: help to reduce feed wastage by ensuring fish are fed when environmental conditions are suitable; collect new or previously difficult to obtain information about the harbour environment and the impact of salmon farming on variables such as oxygen levels; improve the salmon industry's efficiency and productivity; provide real-time data to support decision-making; and, highlight areas where the industry could improve its environmental practices. Deepwater sharks are particularly vulnerable to human impacts due to late age maturity, low fecundity and low natural mortality. These species are particularly difficult to manage because the ability of populations to compensate for any additional human induced mortality is so low that they remain vulnerable, even as by-catch. Not surprisingly, a number of species have been overfished in the Atlantic, Indian and Pacific Oceans. Off SE Australia declines of more than 99% for two species in some areas have resulted in nomination for protection under the EBA Act. Anthropogenic climate change is resulting in warmer waters that are altering the distribution, abundance and life history of many marine species. In south-eastern Australia, the East Australian Current is extending further into Tasmanian waters and persisting for longer periods throughout each year. Consequently, the Tasman Sea is warming at three to four times the global average and contributing to the shift in distribution of several dozen benthic, demersal and pelagic species (Pitt et al. 201 0; Johnson et al. 2011 ). One of these species is the ecologically and commercially important Sydney octopus, Octopus tetricus, which is commonly distributed from southern Queensland to central NSW. As waters have warmed over the last seven years this octopus has been detected along the coasts of Victoria and Tasmania, indicating a very large apparent range shift, with the potential impacts on local marine ecosystems largely unknown. Despite range shifts being documented all over the world, there are large gaps in our understanding of the mechanisms underpinning range-shift dynamics, the evolutionary consequences and how genetic traits can modulate such shifts. 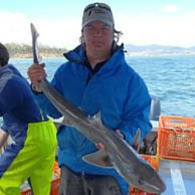 This project seeks to extend work on investigating the role of sevengill sharks Notorynchus cepedianus in coastal areas of south east Tasmania. A major component of the current project is using acoustic technology to investigate the movement patterns of sevengill sharks within these coastal areas. This project will continue using acoustic technology to gather long term data on the movement patterns for the chondrichthyan assemblage of south east Tasmania. Due to the availability of long term infrastructure in the form of permanent VR2 receiver arrays deployed throughout south east Australia, this project has a unique opportunity to monitor long term and long distance movement patterns for several chondrichthyan species tagged with acoustic transmitters in south east Tasmania. Additionally this project aims to determine the size and age structure of juvenile shark populations in nursery areas by using stereo baited remote underwater video cameras (BRUVs) as a survey tool. This multi-species approach will address a range of relevant issues associated with managing and conserving chondrichthyans, such as identifying important habitats for chondrichthyan species, evaluating the effectiveness of protected areas, investigate long distance migrations and predicting predator-prey relationships. The project will have a strong emphasis on conservation and management of top order predators, and will provide optimal management strategies for a number of shark species. This project will address the need for a broader understanding of ecosystem issues in the management of commercial fisheries. For example, it will further build on the knowledge of species interactions in these systems by evaluating the impact of sevengill sharks on other shark species that are commercially fished. This information will assist in ecosystem management (as opposed to single species management) which should be the goal of all conservation and fisheries management plans. Thinking of undertaking a PhD? Feel free to discuss ideas with Jayson, but applicants must have a strong track record, proven writing skills and good overall English.